OCONOMOWOC, Wisc. — A prominent professing atheist group is seeking the removal of a Wisconsin city’s welcome signs because of their religious content. 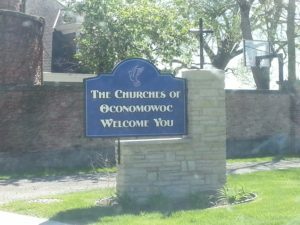 The Freedom From Religion Foundation (FFRF) recently sent a letter to the mayor of Oconomowoc after being notified by a local resident that the city has two signs on public property that read, “The Churches of Oconomowoc Welcome You.” A cross rests on the same structure that holds the sign. FFRF said that contrary to the message of the signs, unbelievers will feel unwelcome. The group asked that the signs be removed from city property. However, the Wisconsin Institute for Law and Liberty soon pushed back by also writing a letter to Mayor David Nold, refuting FFRF’s belief that the signs violate the Establishment Clause of the U.S. Constitution. “[I]t is not unconstitutional to acknowledge the historical role that religion has played in this country. There are many organizations and communities that have made Oconomowoc the vibrant place that it is. One is its ‘churches’ and it is not wrong to acknowledge that,” it wrote. The Institute noted that private parties paid for and maintain the signs, and that the welcome on the signs excludes no one. people who are not associated with the Rotary or the Lions or the Kiwanis would feel unwelcome in the City because of their signs,” it said. The legal organization also pointed out that that as religious drawings are even on display at the nation’s highest court, there is no mandate to purge religion from everything pertaining to the government. The city states that it is investigating, but has not yet indicated one way or the other its position on the matter. As previously reported, the 2005 U.S. Supreme Court decision of Van Orden v. Perry, which upheld a Ten Commandments monument at the Texas state capitol, noted that religious displays may be found in a number of government buildings.